We’d love your help. Let us know what’s wrong with this preview of Kill Shakespeare, Vol. 4 by Conor McCreery. Volume 4 of the award-winning series returns with a high seas tale of pirate battles, vengeance, and lost love. Hamlet, Juliet, Othello, and Shakespeare become pawns in a deadly game of survival between the legendary masked pirate Captain Cessario, his first mate Viola, and the new terror on the water, Titus Andronicus' forbidding war ship The Lavinia. To ask other readers questions about Kill Shakespeare, Vol. 4, please sign up. I was pretty disappointed with this installment in the Kill Shakespeare series. The story lacked both the attention to small details and the more epic and important feel of the previous arcs. The art felt lazy in some cases and I particularly disliked Cesario's mask, which didn't look at all special or menacing; just tacky, and yet seemed to appear on practically every page. From a feminist perspective I was super grossed out by Lucius' plots re: the pregnant Juliet and exasperated by the somewh I was pretty disappointed with this installment in the Kill Shakespeare series. The story lacked both the attention to small details and the more epic and important feel of the previous arcs. The art felt lazy in some cases and I particularly disliked Cesario's mask, which didn't look at all special or menacing; just tacky, and yet seemed to appear on practically every page. What is happening to the Kill Shakespeare series? I feel as though there is nothing to review here with this issue. Hamlet, Juliet, Othello, and Shakespeare are on a ship, Captained by a masked Cessario whose first mate is Viola. Cessario and Viola and crew appear to be pirates, but pirates who are afraid of another ship, captained by Titus Andronicus (okay...I'd be afraid of that ship, too). There are some battles aboard the pirate ship and ... well ... that's about it. Previous books have followed more than one storyline and sometimes leave the reader breathless as the story whips and winds around, and there are sometimes so many different characters in play that you need to have your Shakespeare Spark Notes at hand. But this volume slows it down...way down. Which is a bit odd since they are racing away. Although Othello is on the ship, we tend to only see him when we need a break from the monotony of dialog and he comes up, raging, out of his mind. In Volume 3, we saw Hamlet, Juliet, Romeo, and Othello head to Prospero's island for battle. Now,fleeing and captives of Cessario, it seems that they have become pawns to others who are much less powerful (and less interesting) than Prospero. The art is still fair. More vibrant art may have enhanced this rather dull story. This book feels like 'filler.' As though everyone involved needed some time off and tossed together this volume. I hope it picks up again very soon. Shakespeare and pirates. Who wouldn't want to read that? I hadn't read the previous volumes, so it started quite confusing and abruptly for me, but I got hold of the story pretty quickly from then onward. The illustrations were as they usually are: amazingly powerful and put us immediately in the right atmosphere that is necessary to a storyline like this. They were also vert graphic and violent. Very violent. I would not recommend this to everyone. As for the story itself, I thought it was original, rude and badass. I felt like I was in a parallel universe where Shakespeare's characters were badass pirates and Juliet was in love with Hamlet and Viola was the bravest, most awesome pirate captain I have ever seen, yet they all talked in Shakespearean style! With an explosive ending (in every sense of the word), I will get my hands on the previous volumes as soon as possible. Wasn't fond of the ending, thought that it was maybe a little rushed, but all around enjoyable (like all the other ones). 3.5 bumped up to 4. This book was a departure from the previous ones. It's barely about our ongoing heros at all. They are there and they are semi-important to the story, but they aren't really what the story is about. This one introduces Cesario, pirate extraordinaire, his first-mate/love interest Viola, and his cardboard crew. They are pursued by typical psychopath cannibal Lucius, son of Titus. Speaking of Titus, he was sorta kinda mentioned in a previous volume, but I think I learned more abo 3.5 bumped up to 4. This book was a departure from the previous ones. It's barely about our ongoing heros at all. They are there and they are semi-important to the story, but they aren't really what the story is about. This one introduces Cesario, pirate extraordinaire, his first-mate/love interest Viola, and his cardboard crew. They are pursued by typical psychopath cannibal Lucius, son of Titus. Speaking of Titus, he was sorta kinda mentioned in a previous volume, but I think I learned more about who he is in this world by reading the blurb about his character at the beginning of the book. Missed opportunity. Pořád je to dobré, ale čtvrtý díl nic neposouvá. This was much shorter than the others and, I'll admit, a little bit disappointing. I love Viola to little pieces, however. LOVED this series. Hoping for more! I rated this book WARTY! WARNING! MAY CONTAIN UNHIDDEN SPOILERS! PROCEED AT YOUR OWN RISK! This graphic novel appears to be mainly Hamlet & Juliet (given the cast), with some Othello thrown in, but considering the immense amount of blood-letting and violence, it was far more like Titus Andronicus than ever it was like any other Shakespeare play. I wasn't able to follow it. For one thing, The language was wrong, with expressions from different eras getting mixed together such as, for example, one sentence which read: "You hold thy belly"! Say what? There was - in my ARC - no title page or preliminary pages giving writer/artist/publisher, or other information. It appeared to start in the middle of a story, which made it look like pages were missing, or like this was a continuation from a previous volume which I've not read. Which of those it was, I have no idea. I tried to get into the story and follow it, but it was nonsensical to me. There was no story as such, that I could discern. It was just an endless fight, either verbally between crew (it was set on a pirate ship being pursued by a ship of cannibals, apparently) or violently with swords, cudgels, daggers, etc. The character's idea of a good exchange was to attack someone and preferably end the 'conversation' by ripping out their heart and stamping on it. 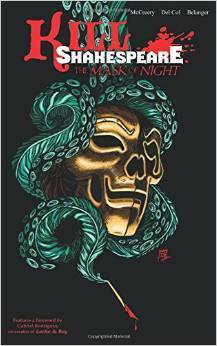 'Kill Shakespeare Volume 4: The Mask of Night' takes place at sea. Our main story has moved off the crazy island. As usual, the art and story are good. The story starts aboard masked Captain Cesario's ship. He and his first mate Viola find something stowed aboard their ship. It's not treasure, but it may prove of value. It's stowaways in the form on Juliet, Hamlet, Shakespeare and a crazed Othello. Surprises abound, especially when they run into Titus Andronicus' war ship The Lavinia. Viola makes 'Kill Shakespeare Volume 4: The Mask of Night' takes place at sea. Our main story has moved off the crazy island. As usual, the art and story are good. The story starts aboard masked Captain Cesario's ship. He and his first mate Viola find something stowed aboard their ship. It's not treasure, but it may prove of value. It's stowaways in the form on Juliet, Hamlet, Shakespeare and a crazed Othello. Surprises abound, especially when they run into Titus Andronicus' war ship The Lavinia. Viola makes some tough choices, and sets up the story for the next chapters. The story, as usual was pretty good, but it did feel a bit like a middle story. The art was as good as it's been for this series. I liked this volume of the story. It's definitely graphic and a bit rough, so know that going into the story. The tale continues, and by the way this books ends, looks to continue even more, with Juliet, Hamlet, Othello, and Shakespeare being rescued by pirates. The pirates are being pursued by those who work for the the new ruler Titus. I picked this book up because it continues a very clever series I am enjoying that retells Shakespeare by blending his characters into a new story. I finished the book because the story drew me on. Now that this book is finished, I want to read more. I would recommend thi The tale continues, and by the way this books ends, looks to continue even more, with Juliet, Hamlet, Othello, and Shakespeare being rescued by pirates. The pirates are being pursued by those who work for the the new ruler Titus. This was awesome! I will be trying to get my hands on the previous volumes as soon as possible. Storyline independent, the artwork was fantastic and the writing was the perfect mixture of Shakespeare and everyday language. Set in an adventure on the high seas and this was a great read. I would highly recommend it. Who should read it? Any comic fan that loves Shakespeare! Please note: I received an advance copy through NetGalley. I’ve not read any of the previous episodes so came into this quite confused: knowing Shakespeare reasonably well, it was at first strange to find Othello, Juliet, Hamelt, Lear, Viola etc.. all together, along with Shakespeare himself. This series of episodes take place mainly at sea in a pirate environment. It is a story of betrayal, mutiny, sea battles, love and lust. There is a lot of action, much of it bloody. This series continues on roiling with treachery, regret, revenge and unrequited love. Even with all these intense passions, this volume seems like a pull back from the intense pace set by the first three volumes. This is still recommended and I look forward to future volumes. Another awesome chapter in the Kill Shakespeare story. If you've liked it so far, you'll love this. My one and only complaint is that it was comparatively short.